Korean American Rainbow Parents (KARP) will kick off its outreach program in New York City with a film screening and community discussion, to be followed by a day-long seminar in Washington, D.C., for parents, activists, and allies from across the U.S. and Korea. NEW YORK CITY, September 5, 2016 – Today, Korean American Rainbow Parents (KARP) announced the start of a national program of outreach and education for family members and allies of LGBTQ Korean Americans. The initiative starts in New York City, with a film screening and community discussion on September 11, 2016, co-hosted by The Least of These Church in downtown Manhattan, the only LGBTQ-affirming Korean church in the Greater New York area. LGBTQ Korean Americans will share their stories and experiences of living with LGBTQ identities while being part of a community often known to be homophobic and transphobic. The event will also feature a screening of “Dol (First Birthday),” a short film by a Korean American director, Andrew Ahn, who made the film as a way of coming out to his parents as gay. KARP’s outreach and education series will continue with a national seminar in Washington, D.C., on October 15, 2016, which is expected to bring dozens of Korean American parents and allies from across the country and from South Korea together for the first time. This watershed event will be the first chance for parents from across the country to build community with one another and start a conversation around how to support their LGBTQ family members’ struggle for rights and acceptance. Professor Namsoon Kang from Brite Divinity School will give a keynote address on acceptance of LGBTQ people in Christian communities. The goal of KARP’s initiative is to provide Korean American families, especially those with LGBTQ-identifying members, with tools and strategies to see beyond their initial feelings of guilt, shame, and fear – and to instead celebrate their loved ones and help make the world safer and more accepting for them. The need for KARP’s national effort is tremendous: Even within the broader Asian American and Pacific Islander community, LGBTQ Korean Americans face some of the strongest homophobic and transphobic pushback from their families and friends. Many cultural and historical forces drive Korean anti-LGBTQ sentiment. This has torn families apart, forced many Korean Americans to leave the community as they came out. And so far, there have been no known efforts by Korean American parents and allies to visibly support the LGBTQ community. KARP – a coalition of accepting parents who openly support their LGBTQ kids – aims to change that. With the continued struggles of LGBTQ people in both South Korea and the U.S., it’s a crucial time for closeted parents and family members to come out in full solidarity with their LGBTQ loved ones. Members of the media interested in learning more and/or attending both the New York City and Washington, D.C. events may contact Clara Yoon at karp.lgbtq@gmail.com. Interviews with Korean American parents and their LGBTQ loved ones may also be arranged by request. *NQAPIA is our fiscal sponsor. Read PDF versions of the KARP Press Release in English or KARP Press Release in Korean. We are happy to partner with the Asian American International Film Festival (AAIFF) in presenting three films: Spa Night, LGBTQ Shorts, and Front Cover. AAIFF is the first and longest running festival in the country devoted to films by and about Asians & Asian Americans. NQAPIA supporters receive a 25% discounted rate for any film showing at AAIFF (excluding the Opening Spa Night, Centerpiece, and Closing Front Cover). Select your tickets at http://aaiff.org/2016/schedule, and after you have added them to your Shopping Cart, enter the promo code NQAPIAaaiff16. Korean-American filmmaker Andrew Ahn’s debut feature film focuses on a young Korean-American man who tries to reconcile his obligations to his struggling immigrant family with his burgeoning sexual desires in the underground world of gay hookups at Korean spas in Los Angeles. SPA NIGHT premiered at the 2016 Sundance Film Festival. This short film program explores the many ways that the LGBTQ and Asian American communities intersect. Some highlights include a lesbian Chinese daughter arguing with her mother about legalizing gay marriage in Ballot and a transgender, adopted activist returning to her native Korea in Coming Full Circle. NQAPIA’s own Janani (pictured in yellow) is in Gaysians, a patchwork documentary that explores relationships with family and culture. Hong Kong filmmaker Ray Yeung’s new film tells the story of a gay Chinese American who detests his Asian heritage and through talent and hard work, has attained his dream job as a celebrity fashion stylist. He soon comes into contact with a closeted actor from Beijing, and their working relationship soon becomes strained by their egos and differing opinions. But a mutual attraction begins to develop, and the stage is set for difficult choices between coming out and bowing to media pressure. What Do We Mean when We Say #APIs4BlackLives? Why and how do we show up in solidarity with the Movement for Black Lives? What do we really mean when we say #APIs4BlackLives? Hear members of the NQAPIA family talk about their personal experiences with police, where their solidarity comes from, and why they are engaged in their communities to support local #BlackLivesMatter organizing. Hear from some of the voices that are typically marginalized in Asian spaces: Southeast Asians, South Asians, trans & gender non-conforming folks, working-class people, and people at the intersection of these and other identities. Now is the time to have hard conversations about solidarity in our communities. Please share our #QAPIs4BlackLives video (bit.ly/QAPIs4BlackLivesVideo) on Facebook andTwitter and lift up these API voices that we rarely hear. Are you interested in continuing this conversation in your community space, organization, or school? Email sasha@nqapia.org to talk about scheduling a training. 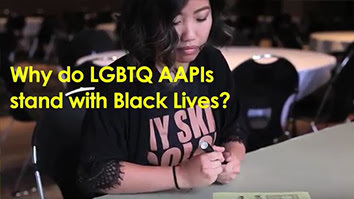 https://www.nqapia.org/wpp/wp-content/uploads/2016/04/qapis4blacklives-video-1.jpg 199 354 NQAPIA https://www.nqapia.org/wpp/wp-content/uploads/2016/06/Logo_NQAPIA_and_Tagline_Web-Ver2.jpg NQAPIA2016-04-14 16:22:102016-09-05 17:20:56What Do We Mean when We Say #APIs4BlackLives?